In his characteristic concern for the spiritual needs of the faithful committed to his care, the late Archbishop Edward F. Hoban, Archbishop-Bishop of Cleveland, on Thursday, June 4, 1964, signed a Canonical Decree, erecting the Mission of St. Victor to minister to the needs of the faithful residing in the general areas of Richfield Township and the northern part of Bath Township in Summit County. The area to be served by St. Victor Mission was bounded on the North by the Cuyahoga County line, on the South by West Bath Road, on the East by the East limits of Richfield and Bath Townships, and on the West by the Medina County line. On that same day, June 4, 1964, The Most Reverend John F. Whealon, Auxiliary Bishop and Vicar General, acting for Archbishop Hoban, gave Father Anthony S. Gawlik his letter of appointment as Administrator of the new Mission of St. Victor. Father Gawlik assumed his duties as Administrator on Thursday, June 11, 1964, and took up residence at Mother of Sorrows Rectory in Peninsula, Ohio. He remained in residence there until April 1, 1965, when a suitable home on Motor Road in West Richfield became available as a temporary Rectory. Necessary preliminary steps were immediately taken to arrange for a suitable facility for the celebration of Masses on Sundays. The Bath-Richfield School board was approached for the use of one of the school buildings, and as a result of their favorable response, arrangements were made to use Eastview Junior High School for Sunday Masses. Final details were worked out with the new Executive Head of the Bath-Richfield Schools, Dr. Frank C. Mayer. It is worthy to note that St. Victor Parish has been fortunate to have enjoyed from the very beginning, a very warm and cordial relationship with the Bath-Richfield School Board and its Executive Head, Dr. Mayer. First Masses for the faithful of St. Victor Mission were offered on Sunday, July 12, 1964 at 8:00 A.M. and 10:00 A.M. in the Auditorium of Eastview Junior High School. At this time, a representative group of men was formed into a Parish Council. Asked to serve as members were: Mr. James Krejci, Mr. John Floberg, Mr. John Ropar, Mr. George Kinches, Mr. Louis Romestant, Mr. Robert Malafa, Mr. Edward Surman, Mr. Edward Pasek, Mr. Reno Alessio, Mr. Howard Kkeil, Mr. Samuel Gasbarre, Mr. Jerome Wendt, Mr. Robert Clerkin, Mr. John Davis, Mr. Thomas, Kehoe, Mr. James Cardina, Mr. August Spillar, Mr. Theodore Berka, Mr. Harley Kemper, Mr. Frank Malachowski and Mr. Raymond Cofta. On Friday, July 31, 1964, a meeting of the women of the parish was held in Mother of Sorrows Parish Hall to organize an Altar and Rosary Society. Its purpose, as outlined by Father Gawlik, was to foster the spiritual well being of its members, to provide for the needs of the Sanctuary and Sacristy, and to organize social activities for the woman of the parish. The first officers elected were Mrs. Carl Smilan, President, Mrs. Edward Pasek, Vice-President, Mrs. Glenn Leach, Recording Secretary,, Mrs. James Viall, Corresponding Secretary and Mrs. James Krejci, Treasurer. As of the Dedication of St. Victor in November of 1966, the Altar and Rosary Society numbered approximately 75 members who received Holy Communion as a group on the first Sunday of every month and met on the first Tuesday of every month. On Thursday, August 6, 1964, the men of the parish were invited t0 meet at Mother of Sorrows Parish Hall to discuss the formation of a Holy Name Society. The response was very gratifying and the Holy Name Society was organized and affiliated with the Diocesan Union of Holy Name Societies. First elected officers were Mr. James Krejci, President, Mr. Jerome Waskowski, Vice President, Mr. Louis Romestant, Secretary, Mr. Edward Pasek, Treasurer and Mr. George Kinches, Marshal. Approximately 85 men of the parish were listed in the Holy Name Society Register. Members received Holy Communion on the second Sunday of the month and met on the first Thursday of every month. From their inceptions, both Societies aided the Pastor in all parish activities. They arranged several social functions and have allocated all funds from these functions to the Building Program. The combined contributions of both Societies amounted to $3,500.00. After the first meetings at Mother of Sorrows Parish Hall, all subsequent meetings were held in the Community Room of the Richfield Clinic. 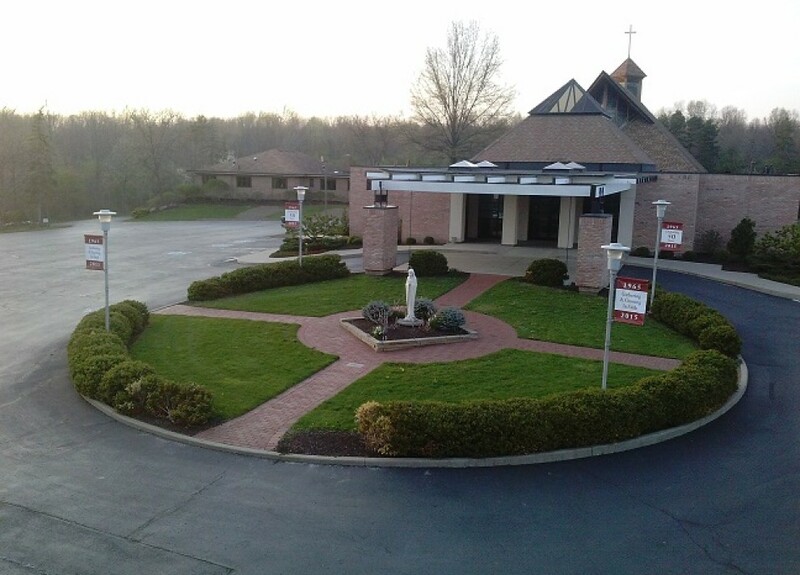 Grateful acknowledgement is hereby made to Dr. Joseph Bartolomeo, Head of the Richfield Clinic, who so graciously and generously offered the use of that facility for two years, until the Parish Hall became available for the parish meetings. With the approach of the school term in September of 1964, it became necessary to organize Confraternity of Christian Doctrine Classes for the religious instruction of the children attending the public schools. Father Gawlik met with Mother M. Roberta, Superior General of the Sisters of Charity of St. Augustine, whose Motherhouse, Mount Augustine, is located within the confines of the parish, to discuss the possibility of the Sisters of Charity serving as teachers of these classes. Mother M. Roberta was quick to assure Father that the Sisters would be very happy to engage in this Apostolic work. First Confraternity Classes were held on Sunday, September 20, 19964 with a faculty of 5 Sisters and one lay teacher, Mrs. John Szereto. Approximately 220 children reported for the first class. A new Sunday Mass schedule also went into effect on that day, with Masses at 8:30 and 11:00 A.M. In November of 1964, after consultation with Diocesan authorities, and after a comprehensive analysis of the potential of the parish, Mr. Theodore Badowski, a member of the parish and head of T. A. Badowski & Associates, Architects, was selected as the architect for the parish buildings. He was authorized to submit sketches for a Church, Parish Social Hall and Administration Building, to be constructed on a ten acre site on Everett Road, near Revere Road, previously purchased by the Diocese. The church was to provide a seating capacity of 500, with provisions for future expansion. In February 1965, after the arrival in the Diocese of the Most Reverend Clarence G. Issenman as Coadjutor Bishop and Apostolic Administrator, the preliminary sketches were submitted to His Excellency for his approval. Bishop Issenman approved the sketches, and authorized the Architect to proceed with detailed drawings and specifications. On Monday, March 1, 1965, Bishop Issenman, in an Official Decree, stated that the needs of the parishioners would be more adequately served by the granting of Parish Status to the Mission of St. Victor. He hereby decreed the canonical erection of the Parish of St. Victor in Richfield Township. At the same time, Father Gawlik was promoted from Administrator of the Mission to Pastor of the Parish of St. Victor. Permission was also granted by the Bishop for a Fundraising Drive in the new parish to help provide finances for the construction of the parish buildings. Mr. John Bruns, a fundraising counselor, was engaged to direct the Fundraising Campaign. At an organizational meeting, Mr. Jerome Wendt was elected General Chairman, with Mr. James Cardina, Mr. James Krejci and Mr. August Spillar as Co-Chairmen. The remaining members of the Parish Council were to act as Team Captains. On Sunday, March 7, 1965, 67 men on the parish called upon every family in the parish to accept pledges and contributions to the Building Fund. As a result of their efforts, the sum of $67,254.00 was pledged to be paid within 30 months. On May 2, 1965, a group of 26 children became the first class of First Communicants in the history of the parish. They received their First Holy Communion at the 8:30 Mass at Eastview Auditorium. Working drawings for the parish buildings were completed and approved by Bishop Issenman on July 2, 1965 and were immediately let out for bids. Ground breaking ceremonies were held on Sunday, July 11, 1965 at 10:00 A.M. This was the first anniversary of the first Masses offered in St. Victor Parish. The celebrant was Father Ludwig Virant, Pastor of Mother of Sorrows Church, assisted by Father John Ciolek, Pastor of St. Basil Church, Brecksville and Father Gawlik. Father George Schnieder, Pastor of Assumption Church, Broadview Heights, preached. Contract bids were opened in the presence of the Rt. Rev. Msgr. Edward Seward, Financial Secretary of the Diocese, on July 22, 1965, and the contract was awarded to the Cleaver Construction Company of Akron, Ohio. The contact called for an expenditure of $285,000.00 for the construction of a church, social hall and administration building. Construction of the buildings was started on Monday, August 16, 1965, and continued without interruption until their completion. The Parish Administration Building was ready for occupancy on June 14, 1966, and on that date Father Gawlik moved from the temporary Rectory on Motor Road to the new building. rior to that, on Sunday, June 11, the Altar and Rosary Society were hostesses at a Shower and Open House for the entire parish, to give all an opportunity to view the new buildings. First Masses in the new church were offered on Sunday, July 19, 1966. A temporary altar and folding chairs were used for the first weeks until the installation of the pews was completed on August 2 and that of the Altar on August 11, 1966. The singular honor of being the first class to receive First Holy Communion in the new church was enjoyed by a class of 39 children who received Holy Communion at the 9:00 Mass on Sunday, September 11. His Excellency, Bishop Whealon on Saturday, October 29, 1966, consecrated the beautiful marble altar, constructed in accord with the new liturgical requirements. Bishop Whealon celebrated a low Pontifical Mass of Thanksgiving after the ceremonies of consecration. Thanks, I found that very interesting. Does anyone know after which of the many saints named “Victor” our parish is named? Is it this St. Victor? St. Victor was a native of Africa and succeeded St. Eleutherius as Pope, about the year 189. He opposed the heresies of that time and ex-communicated those who taught that Jesus Christ was only a man and not God. He was involved in the controversy regarding the date of Easter and confirmed the decree of Pope Pius 1, which ordered the Feast of Easter to be celebrated on a Sunday. He ruled the Church for ten years. His energy and zeal exposed him to persecutions for which alone he deserves the honors of a martyr, which are accorded him liturgically. This pope is named in the canon of the Ambrosian Mass and is said by St. Jerome to have been the first in Rome to celebrate the Mysteries in Latin. He was formerly held in special veneration in Scotland for having sent missionaries there. While we know little about him, we may reflect that it was through such people as St. Victor, that Christianity took root and has survived to be cherished by us some eighteen centuries later.